The E835 is a great quality microphone from the house of Sennheiser, who have almost 70 years of experience in producing sound equipments. If lead singing is your main forte, then a great microphone that will bring out the best in your voice is of utmost importance. 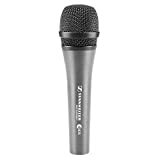 The Sennheiser E835 Dynamic Cardioid Vocal Microphone is designed especially with singers like you in mind for vocal on-stage use. The E835 is a dynamic cardioid hand-held that is perfect for great and natural voice reproduction. The uniform cardioid pickup pattern maintains the sound quality even when singers move on and off-axis but effectively cuts out any ambient noise or feedback. All this and many more features make the E835 one of the best vocal microphones out there. Our Sennheiser e835 review below aims at giving you an in-depth idea about the performance of the microphone and help you decide if this is the right microphone for you. The first thing that you will notice when you pick up and sing into the E835 is that the sound coming out of it will be as close to your natural voice as possible. The dynamic handheld microphone has a gentle presence that provides a uniform tonal response, resulting in more clarity and projection. When used for public address systems too, the E835 is able to produce a very natural sound of the voice with a more open feel to it, rather than sounding very boxy. You will never experience the typical microphone boom with the E835. The reason why the E835 is preferred over other microphones by lead singers is because there is no drop in performance even when the singers go off-axis on stage. The microphone picks up the sound even if you are a few good inches away from it but without picking up any ambient sounds. The cardioid pick-up pattern is the reason behind the insulation that the microphone gets from other on-stage signals. Any electrical interference is also removed by the hum compensating coil. The microphone does not only do well in on-stage applications, it can also be used for at-home recording and in semi-professional studios. The E835 does not have a problem when it comes to SPLs (Sound pressure levels) and in fact can handle even high SPLs with ease. 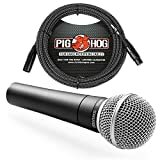 The Microphone has a rugged construction with an outer metal casing that is strong enough to take a beating and yet looks sophisticated with its smooth finish. As microphones do not stay on the stand all the time and are prone to frequent handling, the E835 comes with a shock mount system. This cuts out any impact and greatly reduces the noise arising from handling. Anyone who has used a Sennheiser microphone will tell you that they are workhorses and will last you many years even if you use them on a daily basis. The E835 too lives up to this expectation of the brand. The E835 is not only one of the most popular and fast-selling models of Sennheiser, it is also a great deal that you can get for under $100 for the quality of sound that it produces when compared to some higher priced microphones. The quality of the microphone speaks for itself and a whopping 10 year manufacturer’s warranty proves that the E835 is only made of quality materials for a long-lasting performance. What’s a good review without going into the negative aspects of a product. However, you will see that with the E835, the negatives far outweigh the cons, as with any great product. Weak windscreen – The windscreen of the E835 is not very strong and hence is prone to breaking very easily. Muddy – Being a vocal microphone, the E835 supports a strong voice but sounds muddy otherwise, especially in the lower ends. Midrange limitation – The microphone has a hyped midrange which can sound a bit harsh on strong notes so, it is important not to push it too much. In this section, we compare the E835 Sennheiser microphone with other similar microphones in the segment and see what features are better in the E835. A close competitor to the E835 is the Shure SM58S Vocal Microphone which comes at a slightly higher price. The E835 has a better presence as it has a more high-end frequency response and give a more natural sound. The SM58 on the other hand needs some EQing before it can sound better. But even after the EQ the SM58 tends to lack the body that the E835 is able to produce. For this reason the E835 is preferred over the SM58 by many vocalists and by people who use a public address system. High-quality sound at very high SPLs without distorion or feedback. Naturally attenuated at 120Hz to reduce boominess and handling noise. Mid-range tailored for clarity and presence VLM (Very Low Mass) technology delivers outstanding transient response. The OM5 is known for its clarity, resistance to feedback and ability to handle sound pressure levels in excess of 144 dB without distortion. The OM5 is characterized with an extremely tight and uniformly controlled hypercardioid polar pattern which helps to isolate the vocals from the rest of the instruments on stage. With a wide frequency range of 48 Hz - 19 kHz, the OM5 employs a VLM (Very Low Mass) diaphragm for natural response, accurate sound reproduction and exceptional transient response. 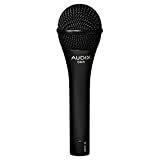 The Audix OM5 Dynamic Microphone is another vocal microphone that is in the same segment as the E835. The OM5 is a great mid range microphone but it drops in performance when the singers move even a few inches away. The E835 has no problem with this and picks up sound very well even when you move away from it. 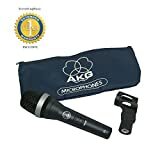 When it comes to vocal microphones, the AKG D5 Vocal Dynamic Microphone is another option in the similar price range as the E835. You get really warm and crisp tones with the E835 whereas with the AKG D5, even though it gives a good crisp tone it does not maintain it in the lower end. The AKG D5 is also a little pricier than the E835, making the latter a preferred choice by vocalists. Being a lead vocal singer can be stressful enough when you are on-stage. When you are performing under pressure and trying to give your best, a microphone that messes up the output is the last thing that you will want. You can of course spend hours on the sound check trying to EQ your microphone before a show. But if you like something that sounds awesome just as is and lets you simply plug and play, then the E835 is what you should get yourself for a total peace of mind and some great sound. Move as much as you want and don’t ever think about a drop in sound as you move and on and off-axis. Ambient noise and feedback will be a thing of the past with the E835. A sleek -looking and a super-strong E835 will last you many good years of singing before you think about buying another great microphone. When you get so much for under $100, there is absolutely no need to think twice. This is the TOP 5 list for Vocal Mics!